Below is Chapter 5 of the Foresight Africa 2017 report, which explores six overarching themes that provide opportunities for Africa to overcome its obstacles and spur inclusive growth. You can also join the conversation on Twitter using #ForesightAfrica. Africa’s “growth miracle” and its associated resurgence has been challenged. Plunging commodity prices related to a global economic slowdown have dampened economic prospects. Human development indicators remain well below developing-country averages. At the same time, climate change and other environmental stresses are taking an increasing toll on many countries. For example, the recent drought in Southern Africa has meant that currently over 20 million people require emergency assistance in Malawi, Zimbabwe, Mozambique, Madagascar, Lesotho, and Swaziland. In a sample of 30 African countries, two-thirds are warming faster than the world as a whole—a trend expected to continue in coming decades. 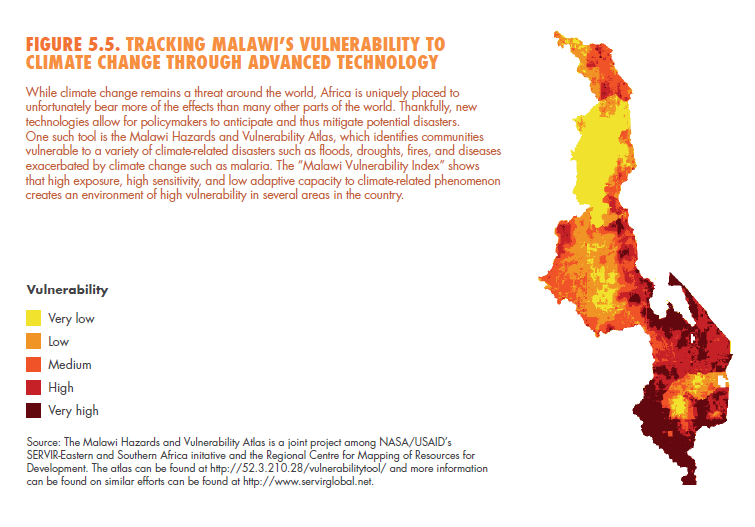 Climate risk is a challenge to both current and future development progress. In a sample of 30 African countries, two-thirds are warming faster than the world as a whole—a trend expected to continue in coming decades. Predictions of future climate change are inherently uncertain, and the future impacts are difficult to predict. This places emphasis on acting early and ensuring that systems are in place to deal with negative climate events. There will also be significant economic implications, particularly in agriculture, where the poor will feel impacts disproportionally. 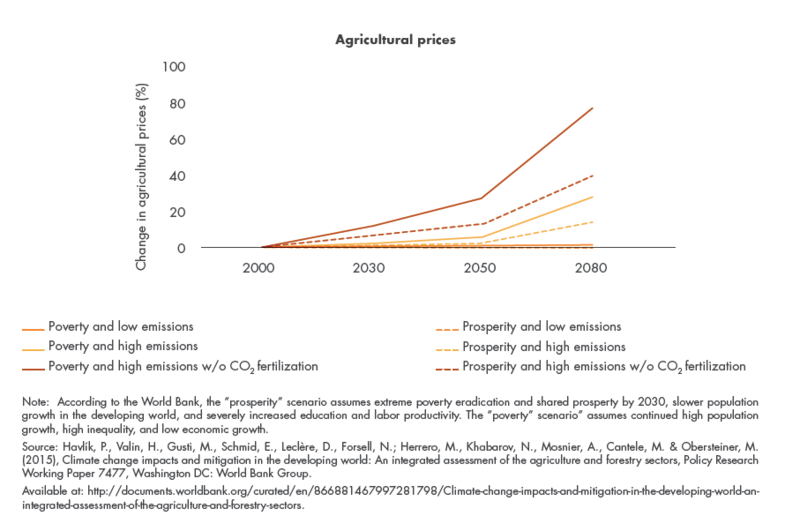 Estimates suggest that yield and output losses for major crops could be 20–30 percent or more by 2050. 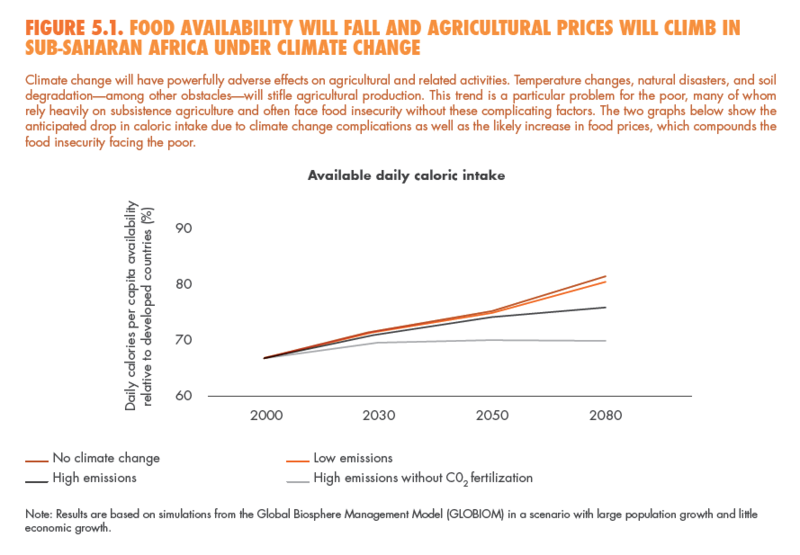 If the transformation of the agriculture sector is a pre-requisite for realizing poverty reduction and wider structural change, responding to climate risk is crucial. The huge variation of different climatic conditions across the continent— arid, tropical, and temperate climates—necessitates tailored local responses. As we enter 2017, there has been global cooperation to deal with climate change, which complements the broader Sustainable Development Goals agenda. The international response to climate change negotiated in 2015—the Paris Agreement—came into force in November 2016. The Paris Agreement aims to keep global temperature rise this century to below two degrees Celsius above pre-industrial levels—a goal looking increasingly unlikely given the greenhouse gases already in the atmosphere. Over 100 countries, accounting for over 80 percent of global greenhouse gas emissions, have ratified the agreement. Each country has developed a unilateral national commitment on what each is willing to do, which if ratified is known as a Nationally Determined Contribution (NDC). Africa as a continent is taking leadership internationally. Coordinating for progressive action, the African Union has supported coordinated negotiating positions through the Conference of African Heads of State and Government on Climate Change (CAHOSCC). In addition, African countries have been a leading voice in the Group of 77, the collection of over 130 developing countries, at the U.N. climate change conferences. Concerns for developing countries, however, remain— particularly around finance, technology transfer, and mechanisms for equitable contributions for dealing with climate risk. Every African country other than Libya has submitted a pledge internationally. There has also been national leadership from African countries. Every African country other than Libya has submitted a pledge internationally. Some countries have been taking climate change issues seriously in national development planning and implementation across multiple sectors for some time—Ghana, Ethiopia, Morocco, and South Africa stand out—and others can learn from their experiences. For example, Ethiopia in 2011 developed a Climate Resilient Green Economy Strategy and has since set up a climate finance fund within its ministry of finance for climate compatible investment. Part of the reason for this leadership is the recognition that climate action and wider approaches to development can go hand in hand—not just for adapting to climate change but also promoting low-carbon growth. Good policies that recognize the close links between economic, social, and environmental priorities can unlock major benefits over the long run. Transform agriculture and land use. Some 60 percent of employment in sub-Saharan Africa is still in agriculture, a sector with low levels of productivity by international standards. Low crop yields and rapid population growth have pushed the expansion of cropland to address food security challenges, but this has simultaneously contributed to deforestation and increased vulnerability to climate change. Policymakers should look to intensify agriculture to boost yields and explore climate-smart farming techniques. Diversify into manufacturing and other high productivity sectors. As countries look to higher productivity sectors such as industry and high-value services to drive growth, they should look to exploit opportunities to “green” existing production processes where it is economically beneficial. New markets domestically, regionally, and internationally could also open up, and there may be opportunities for import substitution. Strengthening infrastructure, particularly around energy and transport will be crucial. Manage urbanization. 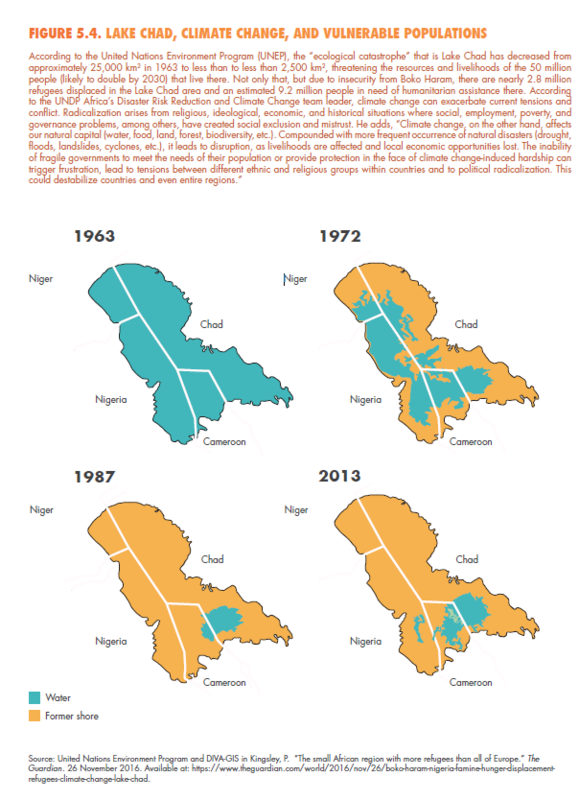 By 2050, the population of sub- Saharan Africa’s cities will increase by almost 800 million people. This is nearly half of the projected rise in numbers of the urban population globally. Many cities are experiencing the effects of poor urban development and urban sprawl. Weak city governments lack resources to fund the required urban infrastructure and public services. For example, Nairobi and Dakar have only $10–15 per year per inhabitant for capital expenditures, and most cities have much less—meaning some areas will get only inadequate basic services. A shift towards more compact, connected, and coordinated urban development will assist in creating a better model for urban growth. Foster a modern energy transition. Sub-Saharan Africa’s per capita energy consumption is 15 percent of that in OECD countries, and the increasing demand for energy over coming decades will be vast. This will require both grid and off-grid solutions. While fossil fuels will be part of the story, the continent has an enormously rich portfolio of clean energy assets, which are increasingly cost competitive even without considering the wider social and environmental benefits. For example, sub-Saharan Africa has about 1,100 gigawatts (GW) of solar capacity, 350 GW of hydro, and 109 GW of wind. There is also an opportunity to exploit current technologies to promote energy efficiency to reduce the required expansion of supply. Keep working on the “basics.” A number of areas are critical whatever the future development trajectory looks like. For example, while gender inequality has fallen in Africa, it stills remains higher than elsewhere in the world. Improving gender equity directly raises women’s inclusion and welfare, and also benefits economic productivity—for example by breaking down barriers to education. How will this development be financed? So far, $100 billion dollars per year by 2020 have been pledged to developing countries to support action. Much will be channeled through vehicles such as the Green Climate Fund and the African Development Bank. Ensuring that developing countries, including those in Africa, actually receive this funding is an important part of ensuring the credibility of the climate change negotiation process. This should look to complement the larger pools of private finance to transform Africa’s societies, which will need to be an order of magnitude larger. 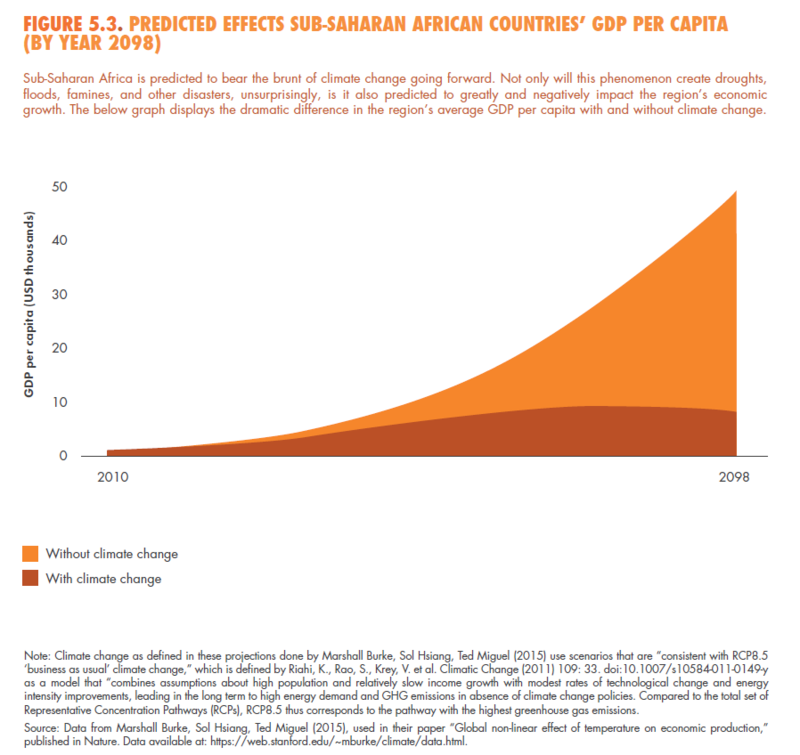 In sum, climate change presents a risk to African countries’ longterm economic transformation, which remains a priority. However, transformation itself would build resilience to climate impacts, and there is potential that it could be low carbon.